You can find sterling silver stud earrings 'Silver Cubes' by Lalana in jewelry categories such as Geometric Earrings, No Stone Earrings, Silver Earrings, Sterling Silver Earrings and Stud Earrings. Enjoy exploring these sections for other Novica treasures. Simple and gorgeous silver earrings for your daily life! So dainty and perfect! I love them! "Absolutely Great Silver Cube Earrings!" 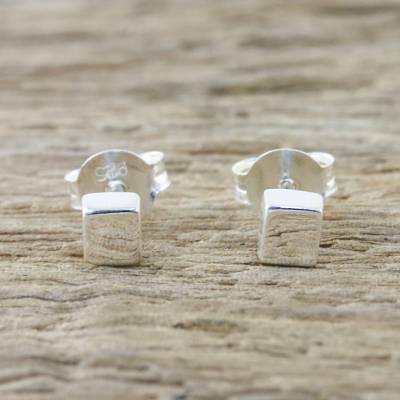 These perfectly sized earrings are very pretty. They are exactly what I usually look for in earrings. Best of all, they are perfect for any occasion. I love them! These are a bit smaller than I had expected but are very nice, regardless. I am a fairly large man and it is difficult to find "masculine" looking earrings.